With the use of neonicotinoids and their impact on the European bee population coming under scrutiny in recent years, some Australian companies are now looking to restrict the use of several key neonicotinoid active compounds from 2020 onwards. Neonicotinoids are among the most commonly used insecticides in the world. Often used as seed coatings or sprayed on to foliage of plants, the chemicals are particularly effective against sap sucking pests, such as aphids. Restricting these chemicals from Australian access has impacts on Australian growers. As such, the project aims to better understand the issue from a scientific and social licence perspective. The project will conduct a literature review on neonicotinoids by assessing global reports and findings, as well as the position of agencies, such as the Australian Pesticides and Veterinary Medicines Authority (APVMA). 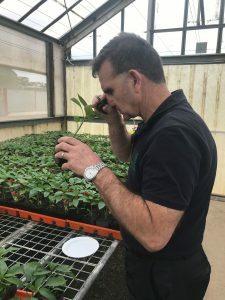 The review will outline key findings and recommendations applicable for the Australian nursery industry including the possibility of safe and reliable alternatives. The second and larger component of the project seeks to quantify the cost savings and productivity gains of implementing a disciplined integrated pest management program (IPM). In particular, it will look at the benefits of structured crop monitoring and site surveillance across a production nursery. An agricultural economist will run an economic assessment for 12 months and examine how much money each business is spending on pesticides and fungicides, labour, throw outs, and other key inputs in the business, as per their current operation. Once the initial economic assessment of the costs associated with pest management concludes, a professional pest scout will be allocated to each production nursery. They will undertake pest monitoring services in line with the requirements under BioSecure HACCP and implement key principles of IPM for the next year (2020). The economist will actively monitor and track progress to build 24 months of solid financial data that demonstrates the ‘before and after’ costs of a structured and well-managed crop monitoring and site surveillance program. It will help to inform the business’s pest management strategies, including any changes to its bottom line. The outcomes of the project will be shared with industry via practical resources, technical factsheets and workshops. It will aim to highlight the benefits of a structured monitoring and surveillance program – from a production, economic and environmental perspective.